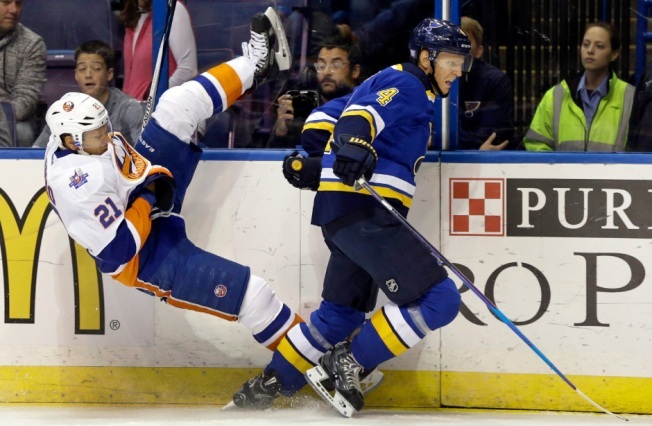 Islanders right winger Kyle Okposo is sent flying after colliding along the boards with Blues defenseman Carl Gunnarsson during the first period. Mikhail Grabovski scored his first goal of the season 4 minutes into overtime and the New York Islanders beat the S.t Louis Blues 3-2 on Saturday night. John Tavares scored his fifth of the season and extended his point-scoring streak to six games for the Islanders. Frans Nielsen had two assists, including on Grabovski's winning goal. Rookie defenseman Colton Parayko had a goal and assist in the third for the injury-depleted Blues, who outshot the Islanders 40-22. St. Louis will be without forwards Jaden Schwartz (broken ankle) and Paul Stastny (broken foot) for an extended period. Kyle Okposo had a power-play goal in the first period for the Islanders, who have won five of six and bounced back smartly a night after losing at home to Boston. Tavares has four goals and six assists during his streak and has 23 points his last 13 regular season games.